"Drill (and cut) as little as possible." In my opinion, the best dentistry is no dentistry at all. Although dentists can now do some amazing things for our patients, there is nothing better than healthy, undisturbed, natural tooth structure. 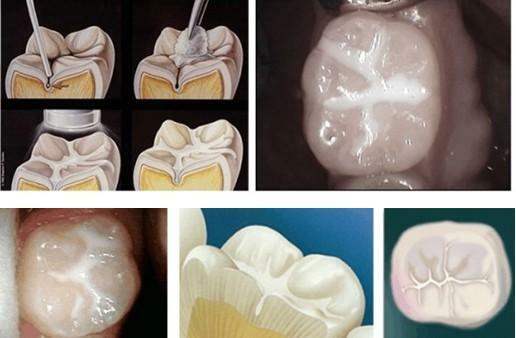 Preservation of tooth structure starts with a meticulous examination of the teeth and the rest of the oral strucures. Early disease detection will minimize the invasiveness of the treatment that may be needed. I use state-of-the-art equipment and procedures to diagnose disease at the earliest stages for my patients. Early diagnosis and treatment prevents the need for more invasive procedures like root canals, extractions, crowns, bridges and periodontal (gum) surgery in many cases. An important part of being a minimally-invasive dentist is preventing disease in the first place. This starts with educating patients about what dental disease is. Dental disease is caused by two things, infection (bacteria viruses, fungus and parasites) and stress from an unbalanced bite . To minimize infection and prevent disease, we educate patients on proper home-care procedures. When patient present with high oral bacterial levels, we treat them with minimally invasive periodontal therapy. In addition to infection control, we analyze the bite for stressful forces on the teeth, muscles and TMJ (jaw joints), then makes recommendations to eliminate the problems for our patients. When drilling is necessary (cavity, crown, etc. 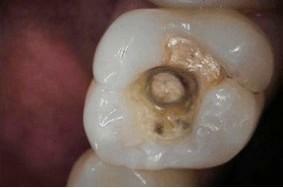 ), we want to remove as little natural tooth structure as possible. The following picture is an example of one of the conservative treatments that I perform in my office. The picture shows a porcelain crown on a tooth. The pink dots by the gum line show where a crown margin would typically end. The green dots show where this crown margin ends. By keeping the crown margin away from the gum line (when possible), I did not have to remove the healthy tooth structure between the two sets of dotted lines. 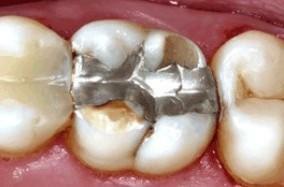 extensive tooth coverage (extracted tooth with traditional crown). When the nerves of teeth do become infected with bacteria from a cavity, I can perform treatments that avoid root canal procedures for my Charlotte North Carolina area patients. Early detection of cavities prevents extensive drilling on the teeth to treat a cavity. The following show minimally invasive fillings placed on teeth because the cavities were detected early. 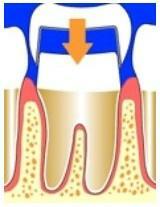 When cavities are detected late, more aggressive drilling needs to be completed to treat the tooth (see below). 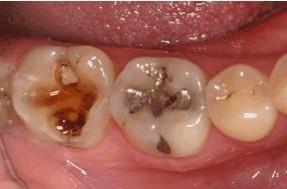 If the decay is advanced enough, the tooth will need a crown or even a root canal. if a crown needs to be placed on the tooth (above).